Written by Stacy Sechrist on October 9, 2015 . Posted in News. NCNSC was invited by partners at Fayetteville Police Department (FPD) to present initial evaluation findings about the Educating Kids about Gun Violence (EKG) program that FPD has been implementing in 7th and 9th grade health classrooms in all of the Cumberland County School System. FPD hosted a one day training for other sites, including law enforcement and resource partners, who may be interested in replicating the program. The local ABC news affiliate in Fayetteville covered the training (Click to view news segment). 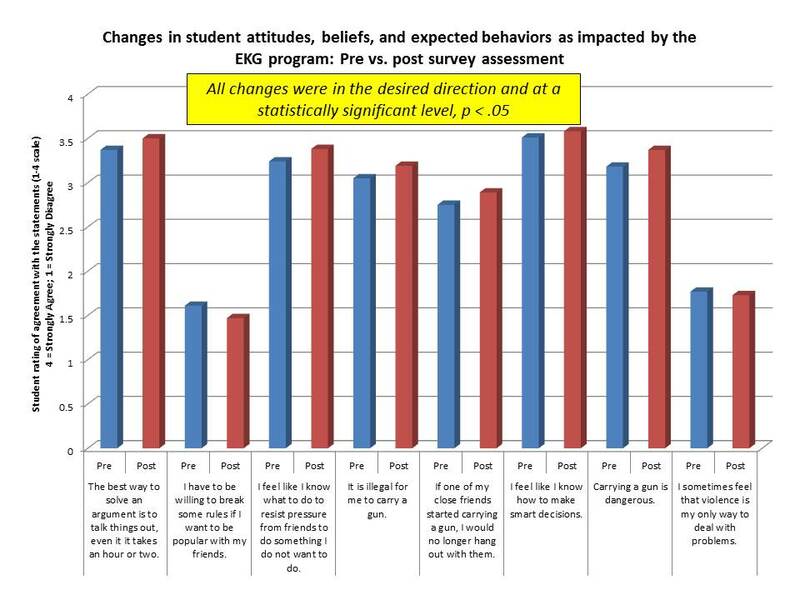 Initial evaluation results are promising for the EKG program showing that students report less favorable attitudes toward guns, gangs, and violence after participating in the EKG program, and report greater self-efficacy in their ability to make good decisions and resist peer pressure after participating in the program. See graphic below which was part of NCNSC’s presentation. For a full copy of the presentation, click here: Sep 2015 EKG Evaluation Results.